One bad deed, many questionable decisions and never-ending consequences. 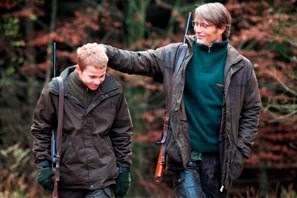 Left to Right: Marcus (Lasse Fogelstrøm) and Lucas (Mads Mikkelsen). It’s a very stark film. Appropriately so, as the plot involves watching Lucas’ innocence being taken away from him, Lucas eventually realizing that his innocence has been taken away from him, and then him trying to figure out how to get it back, or trying to figure out how to live without it. His future is bleak. I have one main issue with the film and that is of Lucas’s response to being told a student has filed a complaint against him. He asks which student, he asks what exactly the student said, and he never once said that he didn’t do anything. Don’t the first two questions imply that he’s guilty of something and he needs to know what to confess and what not to confess, especially without a clear denial? Either way, this innocent man has been relieved of his teaching duties, so sure enough he goes back to the school to corner the kids to find out what they said. If you find any of Lucas’ actions at this point moronic, then this film is not the masterpiece that others are claiming it is. He’s the only central character and you’re either going to feel sympathy for him mixed with a fear for and desperate need for his safety, or you’re going to think that he’s such an idiot that it doesn’t really matter what happens to him. I’m mostly in the latter camp; although the arising question of if he really is innocent or not is an interesting one. The film, though, is expertly made. The way they built tension and suspense from a past event - not a present or future event, but a past event in which we saw what did or did not happen - is astounding. I’m not sure I’ve seen tension based on that type of situation handled better than this. The ending offers a unique look at the character’s life, re-confirming that this is a character study and a character always exists in some form past the ending of a movie. The type of movie that keeps you hooked even when you disagree with the main point of the central character.